Someone brought to my attention this article in the Wire on “poor” Albert Einstein. The author, a facebook expert, is unable to separate the myth of Einstein from the theory of (special) relativity (this intellectual sloppiness is critical to his argument). I had made this distinction (between the person Einstein and relativity theory) very clear, even for layperson, in my TGA acceptance speech, on Einstein’s mistake. Einstein plagiarised the special theory of relativity from Poincare, without fully understanding it, and consequently made a mistake. Decades earlier, I had pointed out Einstein’s mathematical mistake (about functional differential equations) in my book Time: Towards a Consistent Theory, Kluwer Academic, Dordrecht, 1994 (Fundamental Theories of Physics, vol. 65). Before pontificating on “poor Einstein”, Srivastava should have bothered to inform himself. He should have read at least the reviews of that book say the one by J. F. Woodward in “An Essay Review of C. K. Raju’s Time: Towards a Consistent Theory (Kluwer Academic:, Dordrecht)”, Foundations of Physics 26 (1996) 1725-1730, or by G. J. Klir, Review of Time: Towards a Consistent Theory (International J. General Systems 27 (1999) 427-8). Perhaps Srivastava reads so many registered letters, he has no time to read scientific books. Sadly, Srivastava, is unfamiliar with all this elementary physics. He is a scientist by virtue of his job, not knowledge. He would have done better to avoid this public exhibition of his ignorance. The fact is that no one refuted any of my arguments, either mathematical or historical, about Einstein, in the past 25 years, since my first book was internationally published. To the contrary, on the centenary of Einstein’s special relativity paper, in 2005, the supposedly great mathematician Michael Atiyah, a former President of the Royal Society, in his Einstein lecture, endorsed my argument, against Einstein, for it is an argument readily understood by a mathematician. Actually, Atiyah plagiarised my thesis (about Einstein’s mistake) from my above book. (Imitation is the best form of flattery!) So keen was he to falsely grab credit for my argument, that even after he was personally informed, he kept plagiarising it until he was eventually exposed and forced to admit it, and later indicted for plagiarism. Ironically, again, two former directors of TIFR, including the late M. G. K. Menon, supported my efforts (”Petition against celebrity justice”) to bring Atiyah to book, against the Western ethics of always defending cheating by Westerners. This is part 3 of a three part series of posts. It is better if you first read part 1, which pointed out the long-term plagiarism by Joseph violating all academic and editorial norms, and part 2 which explained its ill effects on math education. I know the defence that will be offered for the Hyderabad conference, on mathematics education and society. That the participants do not care about plagiarism and lack of editorial and academic ethics, because they are campaigners for social justice in relation to math. This is false. Colonialism, or invasion of the mind through colonial education, is the most pernicious and oppressive form of social injustice today, affecting the largest number of people. For social justice in relation to math we need to decolonise math. To decolonise math we need to critically re-examine its false history and bad philosophy, as I pointed out in my censored article, now in Journal of Black Studies, and Rhodes Must Fall. But critical re-examination of the West (except the lightweight criticism pre-approved by the West) is taboo for the indoctrinated and superstitious colonised mind. Let me take a simple example. The fake church-story of Euclid is used today to teach formal mathematics by glorifying metaphysical reasoning in the manner of the church theology, and contrary to common sense. The story is fake and NCERT or anyone else in the world is unable to provide serious evidence for Euclid despite my Rs 2 lakh prize for such evidence. There are five lies in that false claim about “Euclid” (see the related section on five lies in my IIT-BHU talk). These multiple lies aim to indoctrinate young children into church dogmas. Why do we still have these false church stories in our school texts? Did our social-justice-mongers ever object. No way! They cannot because they have to show their loyalty and submissiveness to the Western master. They think that keeping silent is a great way to support not only plagiarism but also all kinds of Christian chauvinism packaged with colonial education. 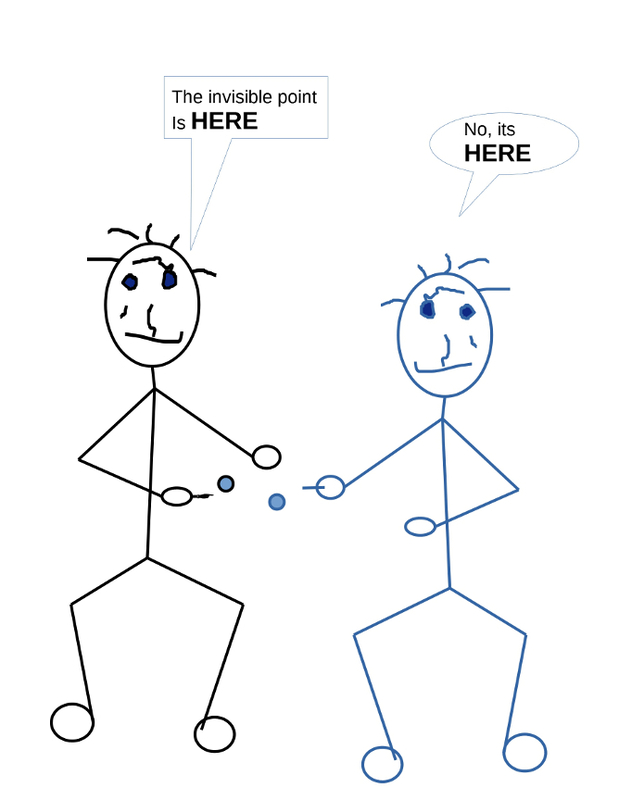 Millions of students fail to understand the resulting metaphysics of invisible points, as in current Indian class VI math texts. This “education” forces them into a state of ignorance about math, hence, science, to force them to accept Western authority as the sole index of truth about both. It enables continued colonial exploitation, even after the supposed end of colonialism. When our social justice-mongers peddle inclusiveness in education (without any critical check on its nature): all they are peddling is inclusiveness into church propaganda to keep people colonised! Note, incidentally, that the related myth of :”Euclid” was invented, like Christian rational theology, during the Crusades, long before capitalism! Note, also, that this Christian chauvinism in history relates to the genocidal “doctrine of Christian discovery” on which Vasco “discovered” India, or Columbus “discovered” America. How many times did our social-justice seekers condemn this genocide, the largest human genocide known to the world? (On my principle of proportionate condemnation, they should condemn inustices proportionately.) This evil doctrine of Christian discovery is still part of “ideal” British and US law, and states that any land or knowledge is “owned” by the first Christian to “discover it”, i.e. they are at liberty to steal it. Joseph and Dennis Almeida know that plagiarism by Christians from a non-Christian was regarded as a high act of Christian morality, as was the genocide in three continents. Joseph, a trained lawyer, knows this evil Christian doctrine is part of US and British law. Hence, also, Joseph et al., have been serially and shamelessly plagiarising my work: they believe as Christians they have a right and duty to steal from non-Christians. And our purveyors of social justice concur by keeping quiet not only about the genocide, but also about the present-day plagiarism! Ha, some social justice this! Finally, no doubt, people like Guru will say they are fighting for dalits even if they know nothing about math education. But is even that really true? Joseph is peddling nothing but a dirty mix of Kerala and British chauvinism, as already shown in part 2. Hence, Guru is doing a a great disservice not only to academic and editorial standards of integrity but also to the dalit cause by tacitly supporting Joseph. The truth will eventually out, and ignorance is no excuse for scholars. Therefore, this is how they will be remembered, Joseph and Almeida as academic thieves of the worst kind, and those who tacitly support them as staunch supporters of academic and editorial dis-integrity and social injustice. Please read part 1 of this blog post first. Plagiarism, or the theft of knowledge, whether of the calculus, or of the calculus transmission thesis, has ill effects on mathematics education. This is not just about cheating in exams. When cheaters turn teachers it will naturally create a problem for the students. As explained in part 1 of this blog post, in my Hawai’i paper of 2000 I had proposed a tough new standard of evidence for the history of transmission of calculus, as “proof beyond reasonable doubt” as in criminal law. This paper involved the very thesis that Joseph and Almeida have serially plagiarised over the last 18 years in the most shameless way imaginable. However, later on, in my book Cultural Foundations of Mathematics: the nature of mathematical proof and the transmission of calculus from India to Europe in the 16th c. CE (Pearson Longman 2007) I introduced a further test for transmission: the epistemic test. Those who cheat and copy, like students in an exam, do not fully understand what they copy. Hence, lack of understanding is positive proof of copying in a suspicious context. (I used to apply this test to my students,) Therefore, imitating the plagiarists spreads a wrong understanding of mathematics. Let us first take the case of calculus. Though Europeans stole the Indian calculus (for their navigational needs) and understood some of its practical value, they did not fully understand it, exactly in the way they had earlier failed to fully understand imported Indian arithmetic for centuries. Two simple examples are as follows. Precise trigonometric values were a key motive for the theft of the calculus. The Indian calculus was used to calculate the most precise trigonometric values then known (accurate to 9 decimal places). Arithmetically challenged Europeans desperately needed those values for a solution of their navigational problems (to determine loxodromes, latitude, and longitude at sea), as acknowledged in the huge prizes instituted by various European governments from the 16th to the 18th c.
The Jesuit general Clavius published exactly those Indian trigonometric values (to exactly the same precision) in his own name in 1607. Clavius cheated, but though he claimed to have calculated trigonometric values to such high precision, he did not understand how to apply elementary trigonometry to calculate the radius of the earth, a critical parameter for navigation. Ha! Indians accurately calculated the size of the earth, from at least a thousand years before Clavius (as confirmed by al Biruni who cross-checked also Khalifa Mamun’s physical measurement of one degree of the arc). Likewise Clavius authored the Gregorian reform of 1582 based on Indian calendrical texts (as his favourite student Matteo Ricci confessed; see Ricci’s handwritten letter in my MIT video or presentation “Calculus the real story”.) But arithmetically backward Europeans even then did not know the correct duration of the tropical year, hence Protestant Europe did not accept the Gregorian reform for the next 170 years, until 1752, long after Newton’s death, leading to many more European deaths at sea. Likewise, George Joseph and his accomplice Dennis Almeida reveal their utter lack of understanding of basic concepts (taught in 9th standard math texts) and have made terrible mathematical blunders, on the record, which show that they are complete mathematical ignoramuses. Some of these have been discussed in my book, in the section on the transmission of the transmission thesis: for example, they foolishly and repeatedly say that solar declination can be measured at sea (how? ), thereby also completely failing to understand my point that the Gregorian reform was needed to be able to measure latitude at sea in daytime. Again in their Race and Class 45(4) 2004 article, written even as the Exeter ethics committee was going on, Joseph and Almedia copied from my Hawai’i paper of 2000, shamelessly failing to acknowledge it, though they had access to it since 1999, which they themselves acknowledged only in 2007 (but not in 2003, or 2004 when they copied from the Hawai’i paper). While some of my points about Indian pramana vs deductive proof are copied with only a few inaccuracies (but copied without acknowledgement, even while an ethics committee was on in which both participated)Joseph and Almeida some interesting statements which expose their mathematical illiteracy. Thus, my Hawai’i paper mentioned floating point numbers, and used a computer program which I then used to teach as part of my C programming course, to make a philosophical point about the failure of the associative law with floating point numbers. I pointed out that present-day practical computations with calculus are all done on a computer which uses floating point numbers. Not understanding this mathematical subtlety, Joseph and Almeida blundered that (p. 46) “the use of irrationals…was accepted in Indian mathematics by the use of floating point number approximations“. How foolish! This was no typo, for they repeat , even more amazingly (p. 51), “the Kerala mathematicians employed…floating point numbers to understand the notion of the infinitesimal and derive infinite series.” My foot! Floating point numbers are a recent IEEE technical standard (No. 754 of 1985) specifically adapted to digital computation. Nothing to do with the Kerala school. And there is absolutely no way in which floating point numbers can be used to derive infinite series. Utter balderdash. Possibly neither Gopal Guru nor Rochelle Gutierrez understands the huge mathematical blunder involved here. But they are all ready to address a conference on math education! As a matter of fact (see e.g. IIT-BHU presentation for the reference and sloka) Nilakantha states the EXACT sum of an INFINITE geometric series. (Finite geometric series were known from several thousand years earlier since the Eye of Horus fractions, and the Yajurveda.) So Joseph also proved he is a historical ignoramus. He lacks knowledge of the original sources or even the related language (but is ever ready to bluff and cover up one crude lie with another, as he did about rajju ganit in my presence in Berlin in the year 1999). 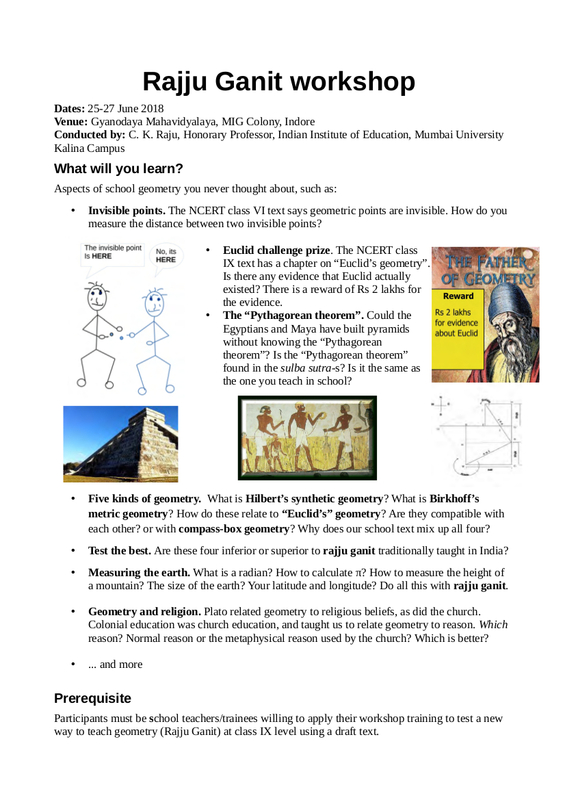 Rajju Ganit, by the way, is a major alternative decolonised course on mathematics that I am proposing at school, as preparation for my decolonised course on calculus without limits, as clear from the linked articles in the IIT-BHU workshop. Obviously, these ignoramuses don’t understand any of its concepts. That damages mathematics education. After my book Cultural Foundations of Mathematics: the nature of mathematical proof and the transmission of calculus from India to Europe in the 16th c. CE (Pearson Longman, 2007) it is well known today that calculus developed in India a thousand years before Newton and Leibniz. Cochin based Jesuits stole it and took it to Europe where it was later falsely attributed to Newton and Leibniz. History, they say, repeats itself. 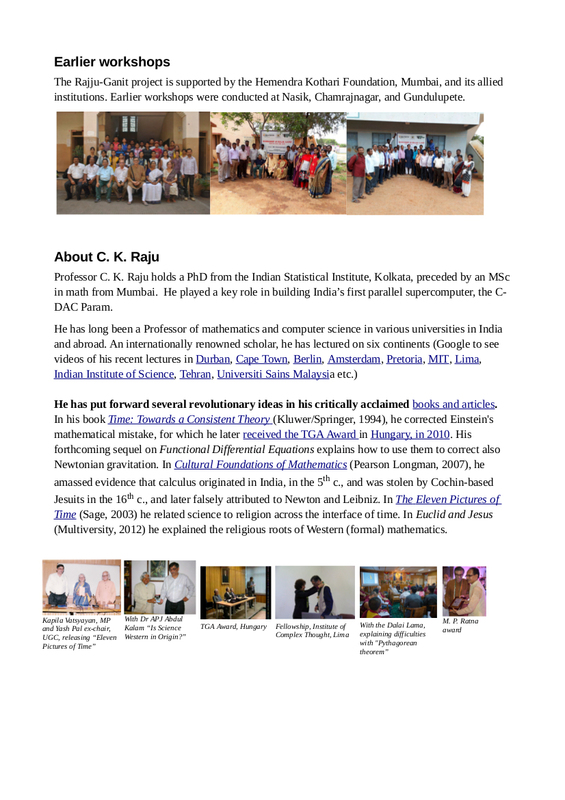 In 1998, I officially started my research project on the origin of Indian calculus and its transmission, on a grant from the Indian National Science Academy, and publicly advertised for a post-doctoral position, outlining my project objectives. Ever since then, George Joseph, author of the Crest of the Peacock, and his accomplices have been systematically stalking my work and serially plagiarising it. I trusted an utterly dishonest Joseph who got hold of my unpublished papers from 1998, and used them without acknowledgement since the 2000 edition of Joseph’s Crest of the Peacock. (The earlier edition had no mention of calculus transmission, the 2nd edition mentions copied various passages in my works, copying at least 3 of my mistakes.) But it is still little known that not only was calculus stolen from India, but my thesis that the calculus was transmitted, was similarly stolen. This despite the fact that George Joseph and his accomplice Dennis Almeida have twice been indicted by ethics committees of Exeter and Manchester universities. 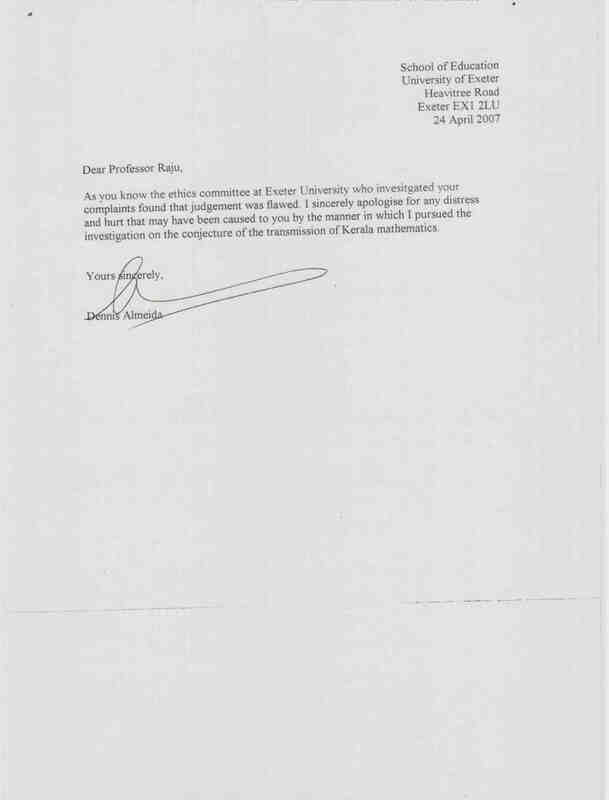 Exeter University later sacked Dennis Almeida who apologised twice, once in 2005, then again in 2007. The second apology was a total deceit, since shortly after that he teamed up with George Joseph to plagiarise a full paper of mine, almost verbatim. The plagiarised paper was one submitted to George Joseph who organized a conference in Trivandrum in the year 2000. As conference organizer Joseph had privileged access to the paper, which privilege he violated by copying the papers verbatim. It is so sad that editors of respected journals like EPW indirectly support this kind of editorial fraud by sharing a platform with Joseph. The proof of verbatim copying is easy. There are three very similar papers involved: (1) my paper (part 1 and 2) of 2000, submitted to Joseph’s Trivandrum conference and called Trivandrum 2000 paper, (2) a slightly modified version of that same paper published ANONYMOUSLY and in violation of copyright law and ethics in the proceedings of the Trivandrum conference edited by Joesph, called Trivandrum 2003, and (3) the same paper (Manchester 2007) but with Joseph included as author, by the artifice of changing the affiliation of the anonymous author to include Manchester university, put on the Manchester university website in 2007, and accompanied by a fake news release which clearly identified Joseph and Almeida as the authors, and led to media blitz in India. The news was clearly fake, since the relevant “research paper” was never published, not even as of now. After the resulting media blitz only the Hindustan Times was decent enough to publish a retraction. It is very easy to check that the Manchester news release was fake news. Just compare the papers Trivandrum 2003 (in the proceedings edited by Joseph) with the Manchester 2007 paper which accompanied the fake news from Manchester. How did a paper published in 2003 turn into a new research paper in 2007 just because it acquired a new author? The news release also said that the publication was funded by the British Arts and Humanities Council (AHRC). How could that be when the paper was already published by the beginning of the grant? Incidentally, that also shows that Joseph and Almeida are financially corrupt. This already shows that Joseph is a brazen liar who can tell any kind of lie, which normal academic plagiarists will not conceive of. But Joseph’s plagiarism can be proved through the internal contradictions in his own claims, and without reference to my Trivandrum 2000 paper. I could not attend Joseph’s Trivandrum conference of 2000 because I was invited to deliver a keynote address at an overlapping major international conference (8th East West Conference) in Jan 2000 in Hawai’i. The related paper was published in Philosophy East and West 51(3) pp. 325–62 in 2001. In that paper, I introduced a new standard of evidence for the history of calculus transmission: the standard of proof beyond doubt used in criminal law. Here is the relevant extract on the history of calculus from that published 2001 paper (and here is the whole Hawai’i paper). The Hawai’i paper was the first to be published in 2001, and the first to state this standard. That is the essence of the paper plagiarised by Joseph. Just compare it with the Trivandrum 2003 paper, and the Manchester 2007 paper. Some more details of cut paste copying from the Hawai’i 2001 paper, in the later papers, are posted online. Another oddity, the UNPUBLISHED version of the Hawai’i paper from 2000 is acknowledged in the Manchester 2007 paper, but not in the Trivandrum 2003 paper. Obviously, if Joseph and Almeida knew about my paper for the Jan 2000 Hawai’i conference, but not of the published version, they knew it from 2000. So, why is it not acknowledged in the earlier (Trivandrum 2003) paper, but acknowledged in the later (Manchester 2007) paper. And once my Hawai’i paper is acknowledged, what exactly is original in either of those plagiarised papers? This is not the sole attempt to fudge references. In the 2000 edition of his Crest of the Peacock., Joseph copied a key passage with mistakes, but without acknowledgement from my 1999 Agra paper on the Yuktibahsa. The Trivandrum 2003 paper acknowledges this Agra paper in notes 3 and 48. But because of the Exeter indiction, in which he participated as a “disinterested party” feeding all sorts of lies to the ethics committee, by 2007 Joseph was aware that I was on to his tricks. Hence, the Manchester 2007 paper makes a clumsy attempt to cover up, by deleting this Agra reference. The attempt is clumsy since a reference to the Agra paper as “cited earlier” is still present in note 53. What clumsy crooks Joseph and Almeida are! Is this what Hyderabad university wants its students and faculty to imitate? The Manchester University ethics committee in 2010 asked its media office to apologise for its fake news of 2007, about Joseph and Almeida, which grabbed media headlines in India because Indian journalists still believe the prime formula of colonial education “trust the West, mistrust the non-West”. Only the Hindustan Times actually investigated the matter and then put up a retraction to its earlier front page news item. As for Manchester university it first said the ethics committee was not authorised to ask the media office to apologise. Later, it took down its fake news of 2007, for even in 2010 that fake news from Manchester university was still unsupported by any published paper. But then it slyly put the fake news right back, after some time, with just an acknowledgement of my work (falsely implying that the the verbatim plagiarist Joseph had contributed even an iota). No sir, neither Joseph nor Almeida did any serious work on calculus transmission; they just stole the thesis, like Jesuits earlier stole the calculus . By inviting a serial and verbatim plagiarist Hyderabad University is doing a grave disservice to the academic community. Is it sending a message to its own academics to plagiarise in this way? Or does it till subscribe to the colonial ethical standard for history that it is OK for Britishers to plagiarise from Indians, but not the other way around. That is the colonial standard isn’t it: loyalty and submission to the Western master? I even put up a blog some time back giving some details “George Joseph: serial plagiarist”. Upon hearing of the Hyderabad conference, I wrote to Gopal Guru and Rochelle Guttiriez who are other plenary speakers at the conference. But neither responded back. I am sure Gopal Guru understand the ethics and politics of silence, and I had hoped that he would refuse to participate. If he does still participate, he surely knows that by doing so he is asserting his and EPW’s tacit academic support for such plagiarism and awfully dishonest editorial standards by sharing a platform with a serial plagiarist, and a dishonest editor. On the Jain ethic, actions speak louder than any purported intentions, so this precedent sets the unwritten policy of EPW as regards plagiarism. Double standards are anyway to be expected from Western academics. Not like #MeToo is it? What does it matter if the minds of millions of colonised are damaged? The second part of this post will deal with the issue of how condoning plagiarism results in bad math education. A conference on decolonisation of humanities was organized at Al Maaref University, Beirut. The big concern was how colonial education has altered human values. But Western education did not come for humanities, therefore my point was that merely changing humanities education won’t result in the desired change. The facts are (1) Western education came to the colonised as church education. (2) It was and is justified on the grounds that the colonised need science. The net effect of (2) is that the colonised foolishly trust the authority of church institutions like Cambridge, Oxford, and Paris. This way the church is able to mix all sorts of subtle poison in university education, even through math and science. Though Western education ostensibly came for science it ensures that the mass of educated are ignorant of math and science, so they are forced to trust authority (of the West, obviously). It further anti-educates them by planting myths, and teaching them to think in terms of stories. For example, due to such indoctrination, the colonised are trapped in the myth that science and church are at war. They failed to notice the obvious fact, contrary to this myth, that colonial education came as 100% church education, and that, for example, the best science colleges, even in India, are still church institutions. Mind control of the colonised was the work of the church, in collusion with the colonial state. This persists, like Western education, even after direct political control of the colonised ended. Once the colonised are rendered ignorant, and taught to trust Western authority and myths, as Western education teaches, there is no solution for them. You are currently browsing the archives for the Science and Society category.